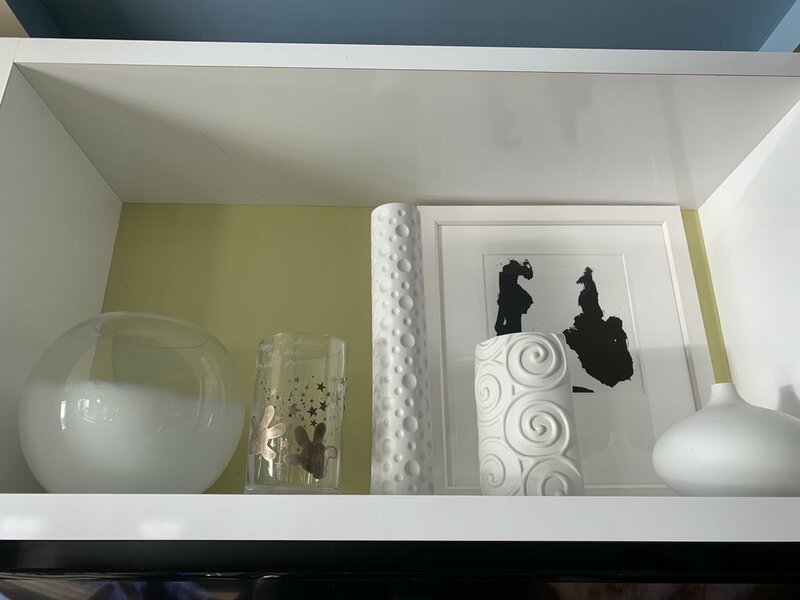 In this post, we review the Atrium Club, the Club Level offering at Disney’s Contemporary Resort. If this is the first post of ours you’re reading, there might be two others you’re interested in. First, we have separately reviewed the Contemporary Resort. If you’re looking for information about the hotel generally, including pictures of our Theme Park View room, you’ll need to read that post. Second—and maybe more importantly—we have an entirely separate post covering the ins and outs of Club Level at Walt Disney World. If you’re wondering about the details of whats included, whether it’s worth it, and just how we evaluate it broadly, you’ll want to check out that post. This post focuses specifically on the Atrium Club Lounge at Contemporary. We booked our Main Tower Club Level Theme Park View room through our choice Authorized Disney Vacation Planner, Lauren Quirk of Enchanted Escapes Travel. We paid $713.70 per night on an Annual Passholder offer rate. The rack rate for the room was $892 per night, which meant our offer rate was about 20% off. For 2019, Main Tower Club Level rooms at Contemporary start at $825 per night. By contrast, Main Tower rooms (not Club Level) start at $651 per night and the Contemporary’s lowest priced room in 2019 is a Garden wing room for $461. Despite the gate staff taking our check-in information, no one met us on arrival at Contemporary. We went to the front desk and checked in. Things went a little differently than usual. It’s common for front desk staff to actually take you up to the club’s concierge desk to check in when they see that you’re Club Level. Instead, we were checked in with no mention of the lounge whatsoever (though she did note we were club level). Since our room wasn’t ready, the CM suggested we go to the parks or visit one of the restaurants. She was incredibly polite and friendly, but this is just a bit odd of a suggestion for a Club Level guest. Instead, I just asked if we could visit the lounge, and she said that would be fine and escorted us up there. This isn’t a complaint at all, just a practical tip that you’ll sometimes have to be proactive about getting up to the lounge, and, more importantly, a reminder that you get lounge access on check-in and check-out day regardless of whether you can occupy your room. We were shown around the club briefly and told the times of the servings. 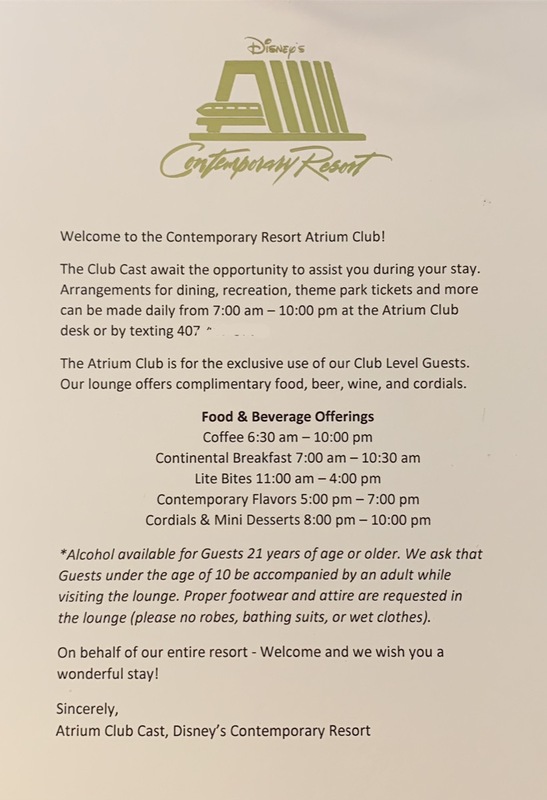 The Atrium Club gives you a card with the serving schedule in your room, so I had to wait until the room was ready to have a physical copy of the schedule (again, no complaints). The first of these is really the most important, and it’s what we focus most on in this review. The Atrium Club Lounge is one big room with a dividing wall and three balconies overlooking Seven Seas Lagoon and Magic Kingdom. Outside the room is the concierge desk, which is staffed by two concierge Cast Members from 7AM to 10PM. The front half of the lounge has the serving area, children’s TV area, and a few more seats. The back half of the room is most of the seating, along with a television. The lounge has seating for 36 adults and four children. Six of those 36 seats are on the three balconies. This is about average for a Disney club lounge. The lounge is quite chic, which was a pleasant change from our past few experiences. This was the first lounge that we can recall where the design and fixtures of the lounge actually were notable. From the lounge, you can see into Magic Kingdom (albeit from a short distance). This is different from, say, the King Kamehameha lounge at Polynesian where you’re looking directly at Magic Kingdom. This overhead view makes quite a difference (pics don’t do it justice, honestly), as anyone walking around Seven Seas Lagoon or riding the monorail gets a good view at Magic Kingdom. How much credit does one give this view? It’s a tough question. A Theme Park View room not Club Level is actually cheaper than a Club Level room by over $100 nightly. So if the view is what you want, there are cheaper ways to get it. Plus you won’t have to fight for balcony space (and deal with all the noisy people) when it comes time to watch fireworks. That said, the 12th and 14th floor rooms (for Club Level guests) and the lounge will have the best views. And this is a review of the lounge itself. Whether it’s “worth it” is worth putting aside for a moment. The plain fact is that when you sit in this lounge, you’re in a constant sense of awe because of the views. Note: Yes, those are the same “view” pictures from my room review. We were two rooms from the lounge, so I’m not being picky about which was which. We have a post Comparing Theme Park Views of Magic Kingdom at the Monorail Resorts if you’re set on a special view. We don’t always dedicate a separate section to crowds at the lounge, but there are a few points of note here. First, this was the most family-filled lounge we’ve visited yet. This makes sense as it’s the best resort for visiting Magic Kingdom. Grand Floridian is also a popular choice for Magic Kingdom fans, but it’s safe to say the Club Level crowd there trends a little older. This didn’t bother us at all, but if you don’t like kids you might have a problem. There was climbing on furniture, crying, running around, and all that. This is obviously a risk at any Disney lounge, and frankly we think it would be silly to hold a slightly higher concentration of kids against the Atrium Club—it’s got too much going for it. The other big issue was during fireworks. We were visiting over a cool few days, and one night people didn’t love going outside and instead obstructed access to the balconies with chairs and tables. We found this a bit ridiculous, but it highlights the popularity of the lounge’s firework view (they also do play the Happily Ever After music in the lounge during the fireworks). As it usually is, breakfast was the most popular meal and the one where the lounge operated around capacity. Few people are lounging around too long, though, so if you arrive and it’s full you can probably just wait a few minutes for a table to open. Great! I think the best comparison to make here would be to BoardWalk’s Innkeeper’s Club, which we thought had great service. While the service at BoardWalk was really excellent for portions of the day, it was about average the rest of the day. By contrast, we found Atrium Club to be consistently great throughout the day, with a few excellent moments. One Cast Member actively remembered and used our names, something that we’ve only encountered once, at the Regatta Club (which we otherwise were very critical of). This particular Cast Member was maybe the best Club Level CM we’ve encountered. We frequently heard her creatively solving people’s problems, she repeatedly asked people if they needed anything, and she even took cleaning up some dishes upon herself, even though she was part of the desk staff. The other staff were also quite good. The lounge was kept very clean, and the only times they let dishes sit seemed to be when they thought it might be awkward to bother someone. Abandoned dishes were always cleaned quickly, and if they could catch your eye they’d ask if they could take your dishes. During the evening servings, it was common for Cast Members to ask guests if they needed anything. During the rest of the day, we’d get checked on every 30 minutes to an hour, which is much better than several of the other lounges. As always, everyone is happy to help you if you flag them down. In our room, we had a nice set of chocolates. Like Innkeeper’s Club, we received a personalized itinerary, which we think is a great touch for Club Level guests. The lounge itself is open 24 hours (due to its open position in the building) though it’s only serviced from 7:00AM to 10:00PM. During those hours, you can request simple alcoholic beverages (beer, wine, and champagne). Throughout the day, coffee, tea, cold beverages, and refrigerated beverages are also available. Servings were typically cut off on schedule, and the Cast Members alerted guests that they’d be breaking down the serving in case you wanted to grab anything last-minute. Lite Bites was a particularly disappointing offering at the Atrium Club, particularly when compared to Grand Floridian, which at least had a soup offering. This is definitely the lightest of the afternoon snacks that we’ve encountered so far. Contemporary Flavors was the highlight of the servings. One night included shrimp ceviche, grilled flank steak, and some very heavy mac & cheese. Desserts were another disappointing serving in terms of quantity. The quality was excellent, though. The nice thing is that after Contemporary Flavors’ bountiful offerings you don’t really need to stuff your face with desserts, so having a few excellent desserts is just fine. Before we get to the conclusions, I want to talk about how much you’re really paying for Atrium Club access. As previously discussed, for 2019, Main Tower Club Level rooms at Contemporary start at $825; Main Tower rooms (not Club Level) start at $651; and the Contemporary’s lowest priced room in 2019 is a Garden wing room for $461 (pic below is pre-tax). There’s one more way I want to look at this. The lowest price on a Main Tower Theme Park View in 2019 is $706 per night. 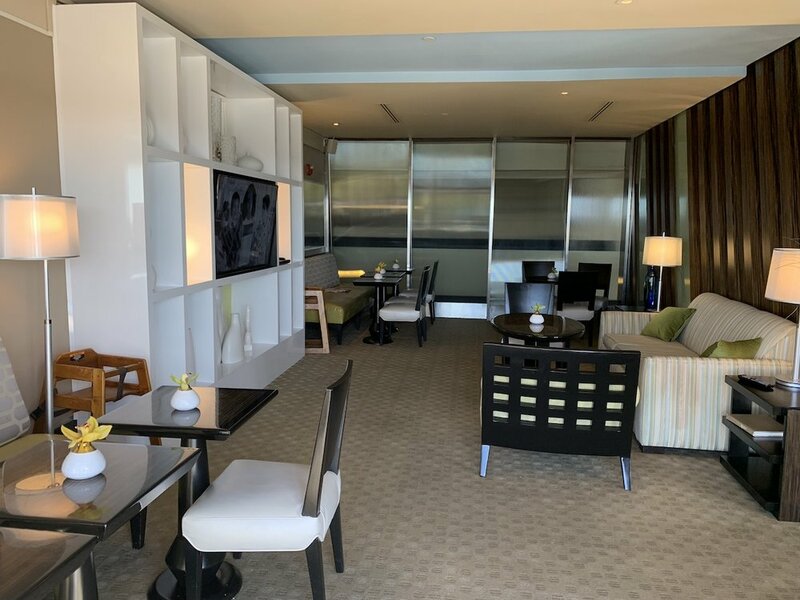 You can get the Main Tower Theme Park View Club Level for $886 (a $180 nightly premium) or cut the Theme Park View and just take in the view from the lounge with a Main Tower Standard View Club Level for $825 (a $119 premium). We rank Contemporary as the best deluxe resort at Walt Disney World because of its good rooms and incredibly easy access to Magic Kingdom. So there are plenty of reasons to consider the cheapest rooms and ignore the Main Tower. But the Main Tower Theme Park View is definitely a worthy “bucket list” item at Walt Disney World. Given that you might be planning for this bucket list experience, it’s then worth it to consider Club Level as an upgrade from that, and that premium of $119 nightly is actually quite palatable. A family of four could easily save $60 nightly on breakfast alone by staying Club Level. Price aside, Atrium Club is one of Disney’s best Club Level experiences. It’s the closest to an actual luxury Club Level experience that we’ve had at Walt Disney World. Yes, the space was small (though no smaller than most of Disney’s other lounges) and the food was sometimes surprisingly limited, but the lounge was beautiful, had a great view, and was very well serviced. Most importantly, Atrium Club Level is priced right—hear me out. Yes, it’s wildly expensive. But most of that is paying for (1) the Contemporary’s quality and walking access to Magic Kingdom and (2) the views. As we pointed out, you can take the very worthy bucket list Theme Park View room and upgrade to Club Level (Standard View, but you get the theme park view from the lounge) for only $119. $119 is actually a fine premium to be charging for Club Level access, especially for the high quality service at Atrium Club! Even if you want to compare apples to apples, a Theme Park View Club Level room starts at $180 more than a Theme Park View without Club Level—still not awful! Despite having positive experiences at other Club Levels, I never thought I’d say one was actually worthy of serious consideration for most travelers who can afford it. But if you can, you should give serious consideration to the Atrium Club Level at Disney’s Contemporary Resort!